This notice explains how we will process your personal information. The British Travel Awards Survey complies with the principals of the Data Protection Act 1998 and The Privacy and Electronic Communications (EC Directive) 2003 and well as the new and updated legislation GDPR (General Data Protection Regulation) of 2018. This policy does not apply to the practices of companies that the British Travel Awards (BTA) and UK Travel Awards Limited (UKTA) does not own or control, or to people that the BTA or UKTA does not employ or manage. Why we collect your data? BTA/UKTA uses information for the following general purposes: to record your vote, your prize draw entry (if applicable) improve our services, conduct research, and provide anonymous reporting for internal and external clients. You will also be asked your age in order to confirm that you are over 18. BTA/UKTA does not accept voting or record any information from anyone under 18. The data controller will use your information for specific travel marketing, customer services and for profiling your travel and voting preferences. If you have requested to be sent further relevant travel information or to be updated with details about future British Travel Awards products/programmes (opted in) we will disclose your information to the relevant third-party travel supporters, e.g., our sponsors, and clients for marketing these purposes. Cookies may be used to compile anonymous statistics. Information collected is aggregated for reporting purposes. No personally identifiable information is collected by this service. The use of this service assists us in measuring and improving the structure and ease of use of our web site. You are not obliged to accept cookies and may modify your browser so that it will not accept cookies. N.B. 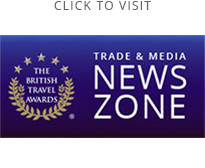 The British Travel Awards e-newsletter contains information from various BTA suppliers, sponsors or marketing partners detailing any goods or services which may be of specific interest to you and/or your business. If you have made a positive action to opt in, you may also exercise your right to opt out of the use of your information for marketing purposes at any time by contacting us by the methods explained at the end of this policy. Your personal information will be disclosed where we are obliged or permitted by law to do so. By returning or submitting a form with your personal information to us, you consent to our transferring your information to countries, which do not provide the same level of data protection as the UK if necessary for the above purposes. If we do make such a transfer, we will put a contract in place to ensure your information is protected. When you request to be removed from further marketing offers, you will be added to a suppression list to ensure your request is complied with. All personal data is processed in line with the requirements of the Data Protection Act 1998, the updates GDPR of 2018 and The Privacy and Electronic Communications Directive 2003. You have a right to ask for a copy of your information (for which we charge a small fee) and to ask us to correct any inaccuracies in your personal information (which is free). When you give us information about another person, you confirm that they have appointed you to act for them, to consent to the processing of their personal data, including sensitive personal data.